The Twister Super Gloss pad has been designed with micro diamonds to bring your coated floors to a super high gloss. It is ideally used on vinyl, linoleum, and wood floors with a high speed burnishers that runs up to 3000 rpms. 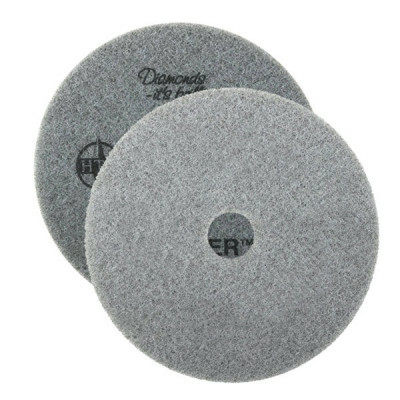 These gray pads are made with 100% recycled polyesters that are infused with diamond that require no chemicals to effectively polish your floors. In fact, this pad should be used dry to produce the gloss you are looking for, and should be rinsed thoroughly between jobs. It is best to dust mop and use our purple diamond cleaning pad on your floors before use of this pad and is recommended to dust mop after burnishing to remove any dust left over. Twister offers a full line of pads for a wide range of floors. All of these pads feature use of micro diamonds to clean and polish your floors. No harsh or expensive solutions are need when using these pads, all thanks to these diamonds. Removing these chemicals from your cleaning provides a safer workplace while reducing the extra cost and clutter of the chemicals themselves. Even without these chemicals, these special pads produce a floor that resists dirt and wear while providing a slip resistant surface. Diamond pads can last up to 3 times that of other pads, even though they are built to only be used on one side. Please take note that the pads should be checked and replaced when the backing starts to show through the underside. Twister pads come in a variety of sizes and grits, so please check our pad guide to see what pad you should use with your specific machine and floor. Used Dry. No chemicals need! Cleaner and safer for the environment. Customers who were interested in the Gray Twister™ SuperGloss Diamond Polishing Pads - Round (17" - 27") - Case of 2 were also interested in the following items. This is a review for the Gray Twister™ SuperGloss Diamond Polishing Pads - Round (17" - 27") - Case of 2.